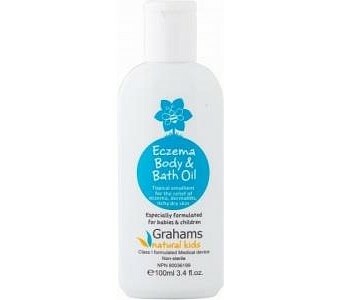 Grahams Bath Oil is a 100% natural product, designed specifically to relieve dry, itchy and irritated skin. For best results use in conjunction with Calendulis Plus Cream. Grahams Bath Oil is safe to use on any age group, including babies and the elderly. As with any product it should be patch tested prior to use. Benefits: Penetrates deep into the skin to relieve dryness. Creates a barrier to protect the skin. Relieves dry, itchy and irritated skin. Use: Add a few drops of Grahams Bath Oil to luke warm bath water and soak for 15 – 20 minutes or apply the oil directly to the affected areas. Direct application is particularly useful for extra dry skin or for getting to difficult to soak areas. For the best results use in conjunction with Calendulis Plus Cream. Ingredients: Emu Oil, Manuka Oil, Apricot Kernal Oil, Olive Oil, Vitamin E Oil, Almond Oil.